Community Life is how we GATHER regularly, GROW faithfully, and ENGAGE passionately here at The Church in the Center. Community Life will be the primary place where relationships are formed, discipleship occurs, and where we share a connected life together. It is also the place where we encourage and equip Christ followers to find God's calling and purpose in their life. GATHER = CONNECTION POINTS - is how we make "big church" feel small. GROW = GROWTH GROUPS - is how we grow in life-changing truth, becoming more like Christ. ENGAGE = MINISTRY TEAMS - is how the Love of Christ compels us. 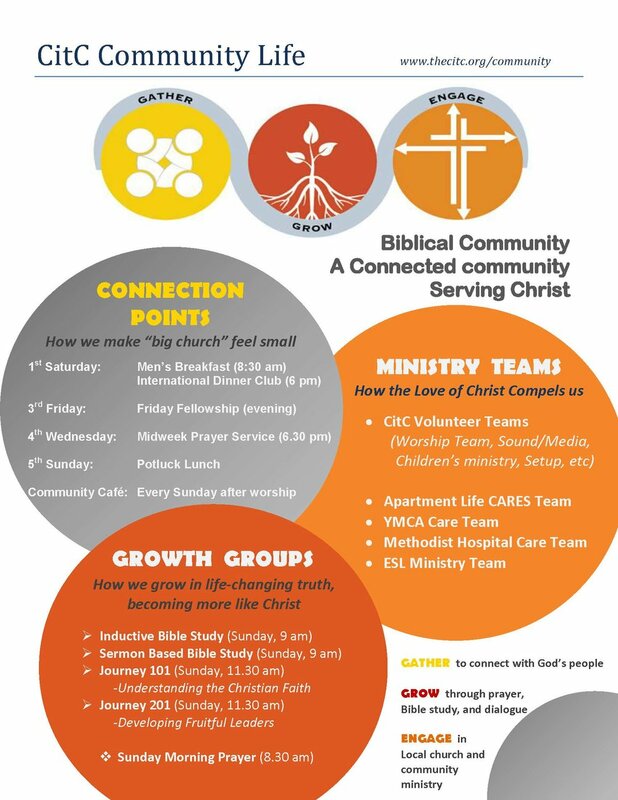 Download our Community Life plan here. Here's where we're gathering this month.